We want to wish all our customers a very Merry Christmas and a Happy New Year. We really appreciate all your gold plated, silver plated and rhodium plated orders and enquiries. 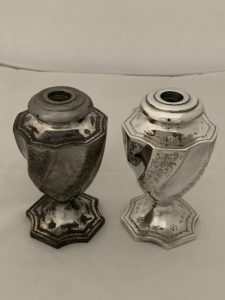 Here we have a pair of Silver plated oil lamps that were in a very sorry state when they arrived. We polished them back to bare metal, then copper plated them. After a final polish they were silver plated to a bright finish. Here we have some before and after images. Our electroplating services are second to none, be it gold plating, silver plating or rhodium plating. Our gold plating company has been established for over 15 years. Gold Plated Car Badges is how Gold Rush Plating started! Several car manufacturers ask if we could gold plate the badges for some show cars they were displaying. 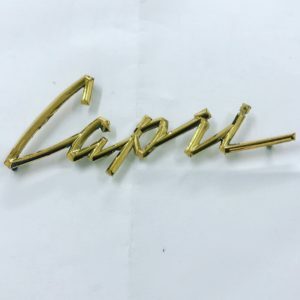 We offer gold plating services for many car components from nuts and bolts to interior and exterior car trim as well as plating car emblems. 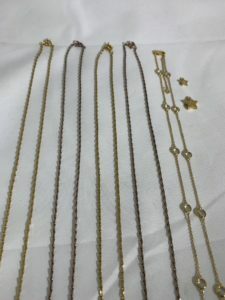 Here we have a selection of recently Gold & Rose Gold plated necklaces. Gold Rush Plating offer bespoke electroplating options for many home and retail jewellery companies. 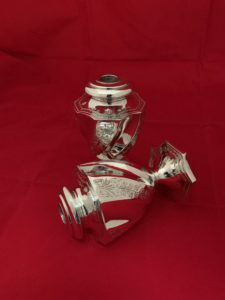 We can gold & silver plate individual items or large quantities to suit the customer’s needs. Most gold plating is returned within 7 working days and our gold plating services are second to none. We also offer a full range of Rhodium, Palladium and Copper plating.